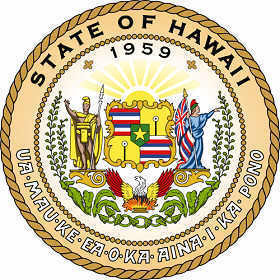 The Hawaii state seal identifies government buildings and officials. The symbolism and history of the seal of Hawaii are described in this article with fast facts and information. The territorial seal of the Hawaiian Islands was designed in 1817 and depicts the sacred chiefs guarding the Hawaiian coat of arms. 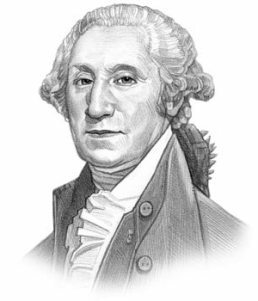 The two royal kapu twins, Kame‘eiamoku and Kamanawa, were uncles of Kamehameha the Great and his counselors in the wars to unite the Hawaiian islands. One bears a a feathered standard called a kahili and the other holds a spear as in the processions of ancient times. The field of the flag is composed of eight horizontal stripes symbolizing the eight major islands of Hawaii, Oahu, Kauai, Kahoolawe, Lānai, Maui, Molokai and Niihau. The rising sun replaced the royal crown from the original coat of arms (see picture below). Beneath the figures and the coat of arms is an image of the mythical phoenix rising from the flame and the ashes to symbolize the change from the monarchy to a free, democratic form of government. The Hawaii state seal is kept and used as required by the Constitution and laws of the state.